I've written so much tonight that Blogger's broken and now only speaks German. Nevermind, this is the last one! 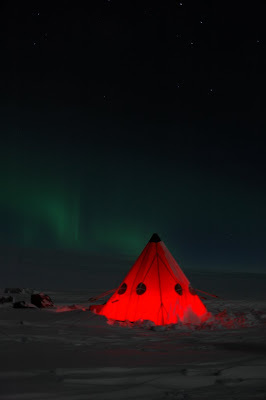 Any hopes of a early night were shattered when I popped out to clean my teeth just after midnight to be greeted by an awesome aurora dancing over the tents! It started in a small letterbox poking through the clouds, but as I brushed it grew, eventually leaping over the whole sky. I pocketed my toothbrush and kicked the tents to wake the sleepers, then rummaged for the camera. *Not including Llangenith on a hot bank holiday! We stood and watched, spell bound, for about an hour. 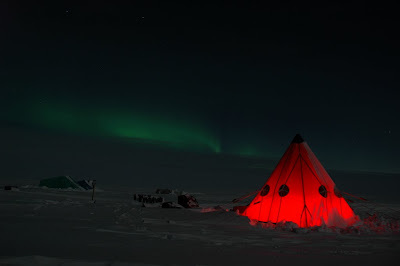 There was enough moonlight to see clearly, but the aurora was strong enough to be distinct. With the equinox gone and 24h daylight fast returning, I think each aurora will be my last. Even if the light allows another display, I doubt there'll be one to stick in my mind more than this. After a hour or so, we snatched some sleep ready for an early start, filling flasks and hydrating before packing up and heading out. Packing camp takes as much time as setting up - three hours without faffing, but clear and still weather helped no end. 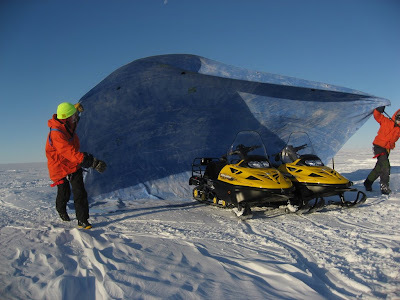 The skidoos had all survived and started on the key, but were still idled for half an hour and rocked vigorously to free their tracks before moving off. Once on the move, the fresh snow allowed excellent progress. 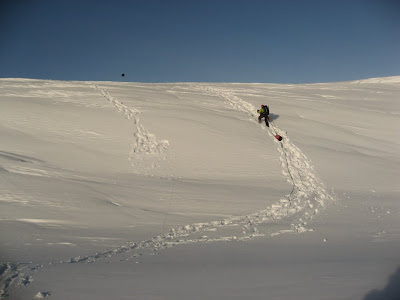 We un-linked on leaving the crevassed area and bounced over the powder mounds with big grins inside our helmets. The ride covered about 40km, bringing us to Windy Bay, home of the emperor penguins. 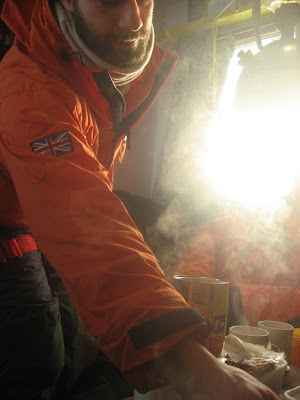 As we were staying in the Antarctic equivalent of a mountain hut - a caboose, unpacking was a lot easier: I just grabbed my sleeping bag, covered the doos and went inside. A caboose is exactly what it looks like - a shipping container with windows and a door. 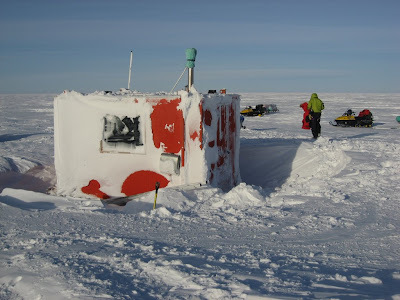 Thankfully it also has a stonking kerosene stove, cooker, 4 beds and a roof hatch incase snow builds up blocking the door. There was only enough room for two people to stand at once, but compared with camping it was the Ritz! Excited about being so close to the penguins, we threw our bags in, grabbed a quick brew and headed to the cliffs, hoping for a visit before dinner. The light was excellent so I shoved an extra camera battery in my inside pocket to warm, but sadly high winds meant we could go no further than the clifftops that night. Snow drifted off the cliff tops making spectacular eddies of spindrift and though we couldn't go any further, the sunset made the walk worthwhile. When the sun and temperatures dropped, we headed back, agreeing to get up at dawn to catch the best light. After a cracking night's sleep (it's amazing how much better sleep is without the ground creaking and cracking below), I woke with my alarm at 6am, only to hear the wind howling round the chimney. A radio call to base confirmed what we already knew - it was over the limit and we were going nowhere. 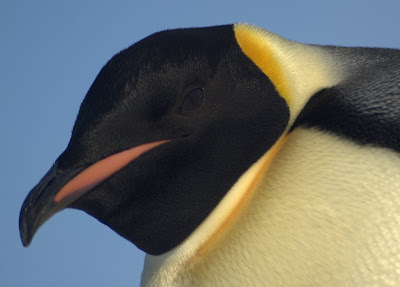 Feeling gutted at the prospect of a third failed penguin trip, I drifted back to sleep. Three hours later, things had changed. The wind had dropped, the sun was out and we could go! 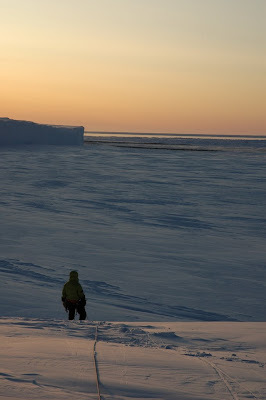 Back at the edge of the icecliffs, we banged in an anchor, set the abseil, crossed a crevasse and dropped onto the sea ice. 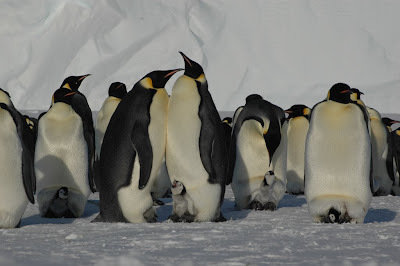 A handful of penguins had seen us coming and waddled over importantly to give a noisy welcome. 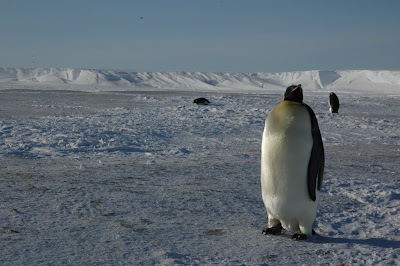 Looking and acting like doormen, they sqwarked and stared as we passed the roamers and headed to the main colony. It was fantastic! As they have no land-based predators, the Emperors had no fear of humans and wandered up to investigate the strange coloured incomers to their home. The colony was split into two groups on either side of the headland, perhaps with a few hundred per group. 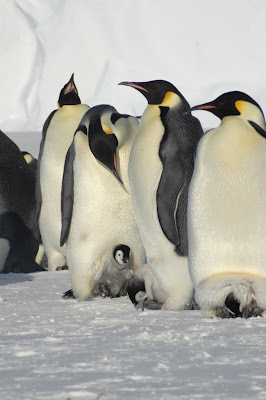 Within the group, a few adults still sat on eggs, but the majority had fast growing fluffy chicks at their feet. They were great fun to watch. Very human-like, not only in their stance, but also in interactions. Some neighbours were best of friends, others sworn enemies. And it seemed to all be down to petty boundary disputes! The ride home was a brief 18km, but long enough to reflect on an absolutely wicked trip. 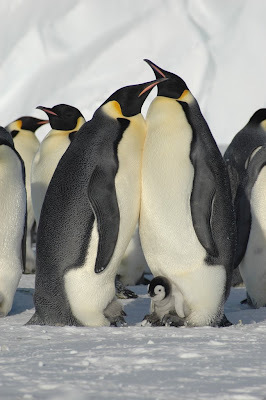 Awesome pics there Mr. Evans, I'm sure my resident Penguin Expert will be incredibly jealous! Are there set limits to going out depending on the met conditions, eg if the wind is above 10 knots nobody goes out? Dave: There's a windspeed limit on sea-ice travel, but the main dictator on travel is contrast. If you cant see the ground conditions, you can't move. This can be particularly frustrating when the horizon is clearly visible 20km away, but the snow surface is totally, uniformly white. It's caused by sunlight reflecting from the snow to the cloud and back again, so light comes from all directions. 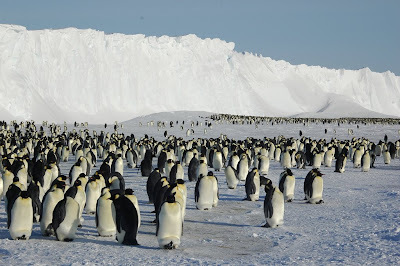 Great photos, blog entries and videos - I'm on my way to Antarctica via S. America in a month - can't wait to experience some small portion of this amazing location - hope to blog, photograph and video as much as possible. Any suggestions, advice? 1. Antarctica wrecks cameras. Make sure you've got a waterproof bag, not only for the rainy islands but also to leave the camera in when you bring it in from the cold to stop condensation forming inside it. 2. Press all the buttons! Know your kit and what you want to achieve. 3. Composition rules. Don't just strafe with the lens! 4. Let the wildlife come to you. If you sit back and relax, they'll come right up close. 5. Mind the fur seals. They bite. 6. With video, pan loads slower than you think is necessary. 7. Put the cameras away. Give yourself time to simply take it all in. Hope you have a great trip. Send me a link when you get blogging!